Our family is flung far and wide. From Arizona, Colorado, Georgia, Texas, and Virginia we came. Thirty two of us from four generations, gathered for a wedding recently on the family farm in Ohio. It was a breezy, sunny Midwest weekend as we congregated at Grandma’s house, filling the rooms, beds and every available chair. She had been in the kitchen for days before our arrival baking homemade cinnamon rolls, brownies and cookies, canning pickles and beets, picking all manner of produce in the garden, and chopping veggies for casseroles and salads. Every meal was a veritable feast of organic, fresh, wholesome farm fare. Sweet corn was in season and came freshly picked from the neighbor’s farm market. Grandma’s zucchini was featured in a casserole and zucchini bread. We had lettuce, tomatoes, onions and cucumbers fresh from the garden and hamburgers from locally raised beef. The cheese came from a near-by Amish farm and the milk came from our own family dairy. Down on the farm, it is all about faith, family, food and fun! This family farm has been tilled for three generations. Originally a cattle and beef operation, it is now an organic dairy farm owned by one of five brothers who grew up on this land. He in turn, has five children who help with daily chores and the business of farming. They grow hay, wheat, corn, soy, and spelt right now, though the crops rotate. 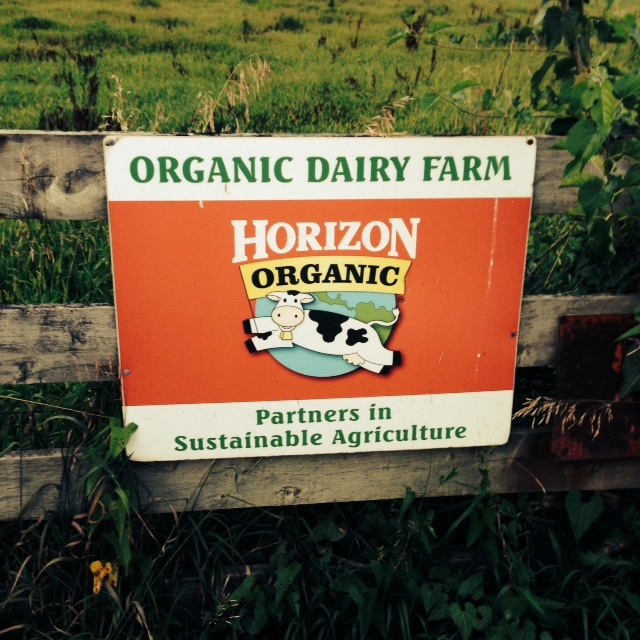 Twice a day, they milk 80 dairy cows which produce about 450 gallons of organic milk per day. 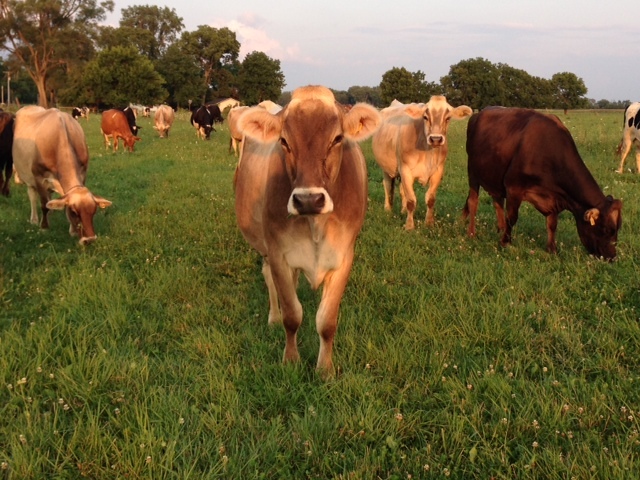 The herd consists of Holstein, Jersey and Brown Swiss cattle. The rich milk makes delicious ice cream, which we always hand crank in White Mountain Ice Cream makers for every family event. Grandma has perfected the recipe and everyone else takes turns cranking it into the heavenly frozen treat. We use a favorite chocolate-walnut recipe that has been handed down for generations called Mopeka. The eggs and walnuts often came from the farm along with the milk. Great Grandpa used to peddle Mike-sell’s potato chips as a young man and so these chips are always served with the Mopeka. 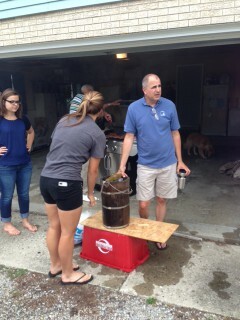 It is one of many family traditions observed by this tribe. We have made this pilgrimage every summer since our children were little. The now grown grandkids love to tell “remember when” stories from all the memories they have made with their cousins on Grandma’s farm. Some years Grandma had the grandkids by themselves. They learned to cook, sew, garden, milk cows, feed calves, gather eggs, bale hay, make hay forts, and round up the cows for milking on four-wheelers. Grandma always took them to Vacation Bible School and the county fair where she was a food judge and their daddy had entered livestock as a child in 4-H club. With grubby, happy faces they ran in the fields, climbed trees, and played in the barns all day long, working up voracious appetites. We ate heartily at Grandma’s table; always dressed in colorful, home-made tablecloths and laden with the season’s harvest. This year, a wedding brought us together to catch up, reminisce, and celebrate the blessings of family. On the farm, my children have learned about love, faithfulness, respect for the land and hard-work. The wedding of our niece was lovely. She was married in a small country church attended by our family for generations. My husband’s grandparents were married there and are now buried in the cemetery on the grounds. The bride’s uncle, a pastor for 35 years, conducted the ceremony. Her grandparents, aunt and uncle sang in the wedding and cousins served as photographers. The happy couple left the quaint church in a sleek, white limousine sipping champagne; headed to the reception venue in the city; the 29th floor of the Racquet Club and a world away. It was a grand party with many friends and extended family members on the guest list. There were elegant hors d’oeuvres, another lovely meal, libations, music and dancing. The twenty-something cousins surprised us all with their lively dance moves while the older crowd marveled at their energy. Photos captured the moments as memories were made. The weekend came to a close after attending church and eating one last meal together. It was a joint effort with many hands in the kitchen. The meal was tasty but the highlight was the dessert; Mopeka ice cream hand cranked that morning. Everyone excitedly awaited the creamy treat as it was reverently dipped out of the old wooden bucket. And the Mike-sell’s chips were passed at the same time. We were filled to the brim with fresh air, fresh food, Grandma’s love, and farm fun. After the cars were packed and the plates cleared away, we began our good-byes with hugs all around. We realize this is a special place; sacred ground. We are grateful for the legacy and heritage of farm life and for a family that lives ‘in unity” as Uncle Greg preached at church that day. We always leave the farm with some goodies from Grandma. This trip, it was canned pickles-a little bit of love and the farm in a jar.